This post is going to be brief as I am literally heading out the door to catch a flight. I’m headed to my fourth and last blogging conference of the year – this time on home soil! Blissdom Canada runs from October 13-15 in Toronto and I’m thrilled to be speaking (topic: Using Social Media for Social Good) at the conference, as well as partnering with Karen to be ‘Tribe Leaders’ for the food bloggers in attendance. The agenda looks amazing and I’m looking forward to getting to know more Canadian bloggers. Now, as you know, last weekend was Thanksgiving and we enjoyed a gloriously warm long weekend. We also enjoyed time with family and friends, a break from school and work for Danny and Noah, and plenty of pie. 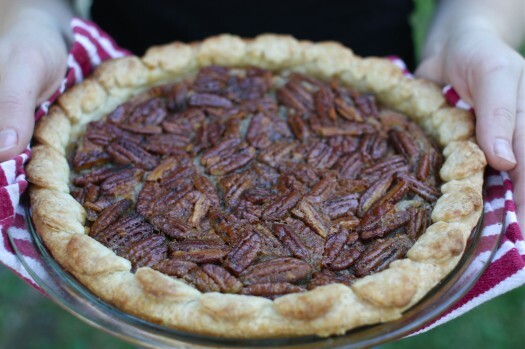 Here’s what’s great about this maple pecan pie: there is no sugar or corn syrup inside, it’s not overly sweet, and contains plenty of nuts – no skimping! It also travels well, and if your husband happens to toss a hefty camera bag on top of it in the trunk of the car, it will survive. Oh, and did I mention my three year old could pull it together? Well, the filling anyway. I took care of the crust, which, before baking was an adorable procession of turkey cutouts, and after baking resembled a pile of misshapen snails. Bottom line? This pie is going in the handwritten family cookbook and going to be around for many Thanksgiving celebrations to come. 1 unbaked 9-inch pie shell, I use 1/2 a recipe of Rich Pie Crust and freeze the other crust. Beat eggs in a bowl. Add maple syrup, flour, melted butter, vanilla and salt. Mix well. Add pecans and stir filling to coat the nuts. Pour pie filling into the pie shell and place on the middle rack of the oven. Bake for about 40 minutes, or until crust is brown and the middle of the pie has puffed up. Remove from oven and place on a wire rack to cool. Pie will be puffed up quite unnaturally, but will sink as it cools. Are you nuts over pecan pie? Would you try this version? This sounds wonderful – I would love to try it with tart shells. Now, I LOVE this idea! The pie isn’t so pretty when it is cut, but individual tarts would be just stunning, not to mention fun. I made this at Xmas but I called it Butter Tart Pie, and of course, because butter tarts as I learned to make them over 60 years ago did not have pecans, I didn’t use them. I used currants for one pie, and finely chopped walnuts for a second. Then, caved to popular demand and made a third pie with walnuts and chocolate chips (finely chopped). It was all very good, but my fav was the first. Butter Tart Pie. I’ll be doing it again this year. This sounds wonderful. I’m definitely going to try it (I love pecan pie and maple :). I’m fairly certain the rules were that as long as it was unbleached and not enriched, any flour could be considered unprocessed. I know people who grind their own wheat and can make an all-purpose, so I believe that’s how it plays. well, that’s great news. About half of my concessions weren’t concessions then :D.
This looks awesome. I’m a sucker for pecan pie. You must toast the nuts first–the flavor is amazing if you do. I usually use brown rice syrup in lieu of corn syrup but this year I’ve got to try this recipe. That sounds like another great option. Thanks, Karen. I LOVE pecan pie but was always grossed out by corn syrup. This is such a great alternative – especially because it has MAPLE in it!! Absolutely want to try this recipe. Love that it uses maple syrup, hate that it’s so expensive, but I guess sometimes you can’t have your cake – er, pie – and eat it too. Have fun at Blissdom, and yay for baby bumps! It’s definitely a pie for a special occasion. The good part is that it is very rich and filling, so one pie can serve 12. Oh thanks for the reminder. I need to make that chili again soon. It’s getting coooold up here! We’re grain free. I could it be done without the crust? And the little bit of flour? Or would I be looking at an ooey-gooey disaster? I’d try a nut crust, pressed into a pan. You’d probably be fine leaving out the flour in the batter. Let me know how it goes if you do try it! I will be making this soon. My hubby loves pecan pie and I can’t stand the cloying sweet gelatin junk that the usual one is. And we have changes our eating so much over the past 5 years likely he would not enjoy the old standard. But this sounds amazing! Can’t wait to surprise him. 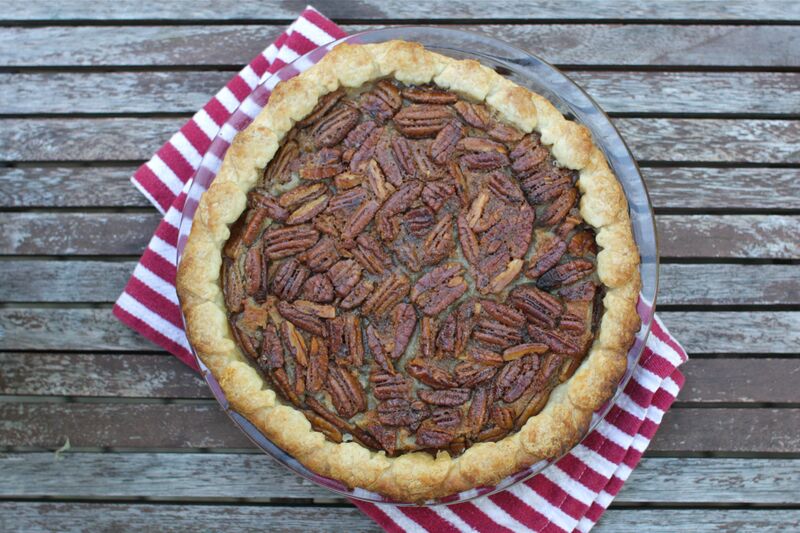 Here’s the thing, I never eat the pecan pie from my family because there’s so much sugar in it (it’s extremely sweet), but I might try making this one because of the maple. I think it’s time for an adventure (and time I finally “brake in” my pie dish). Pecan pie is my favorite, and this maple pecan looks unbeatable. Absolutely yummy! Yum! My go-to pecan pie recipe doesn’t use corn syrup and only uses a little sugar, but I’d love to try eliminating the sugar completely. I’m sure the maple complements it wonderfully – can’t wait to try this for our Thanksgiving spread. There’s no change in the measurements for flour and you can use any kind of maple syrup grade. Happy baking! I make maple syrup. It comes in grade A light amber, medium amber, and dark amber. There is also grade B which I very dark and commercial which is stronger yet. I’m guessing that dark amber may be the best for this recipe. A tip: stay away from cheaper store label syrup. The flavor can be off. There can be big difference in the taste of maple syrup. I’ve had great syrup from both large and small producers alike. I’ve also had off tasting syrup from “boutique” producers. Good luck. I made this for Thanksgiving and it was SO amazing! We all loved it, and love that it doesn’t have corn syrup. In fact, it is 7:40 am the day after Thanksgiving and I’m just starting another one for dessert with friends tomorrow night! Good for you, Naomi! I’m so glad you enjoyed the pie. Happy Thanksgiving! I’m not a fan pf pecan pie but my hubby loves them. Your recipe looked and sounded great. I made it and we all loved it. Thanks for sharing. Do you have a recipe for the nut crust? Im gluten intolerant and am looking for a good crust for my other pies. Thanks!!! Made this and its WONDERFUL!! !How can I make it deep dish? The depth of deep dish pies vary, so this is a happy medium. Add more or less pecans for a quick adjustment. I made a gluten-free version of this pie with gluten free crust for Thanksgving and it was a huge hit! I modified the recipe slightly by adding a tablespoon of cornstarch and reducing the maple syrup to 1 cup and adding a 1/4 of brown sugar to thicken the filling based on other comments. I also warmed the mixture on the stove before filling the pie shell and increased the pecans to 1 cup and toasted them. It created a perfectly set pie! I know it’s not quite as healthy, but it was a special occasion. I really wanted to make a pecan pie but I was determined not to use corn syrup. Thank you for this inspiring recipe! 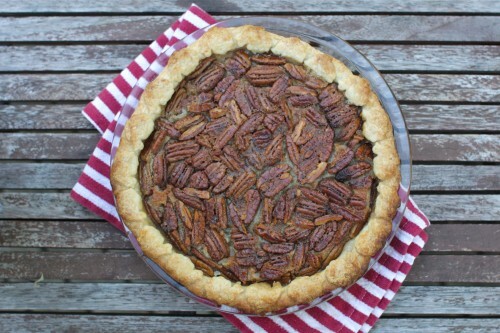 Found this recipe while looking for a pecan pie without any refined sugar & made yesterday. Since eliminating refined sugar from my diet, I was worried I’d miss my thanksgiving favorite – pecan pie. I am absolutely impressed, the recipe was SPOT ON and absolutely delicious! I didn’t use a crust because I didn’t feel like messing with one, and I don’t even miss it. Thank you for creating this recipe years ago!!! So glad I found it.